This small bottle of our top quality ink Jagua tattoo gel is the perfect way to familiarize yourself With our product. The soft plastic bottle you eat with a sealing top and built on applicator tip for easy use. Simply create a hole with a needle or a thumb tack on top of the applicator tip. We recommend to start small and enlarge the hole applicator as Necessary. We recommend to buy Extra Applicator Bottle With the green top. Store it in a cool location for up to two weeks no more than 30 days. After 30 days the jagua stain is less and less strong. 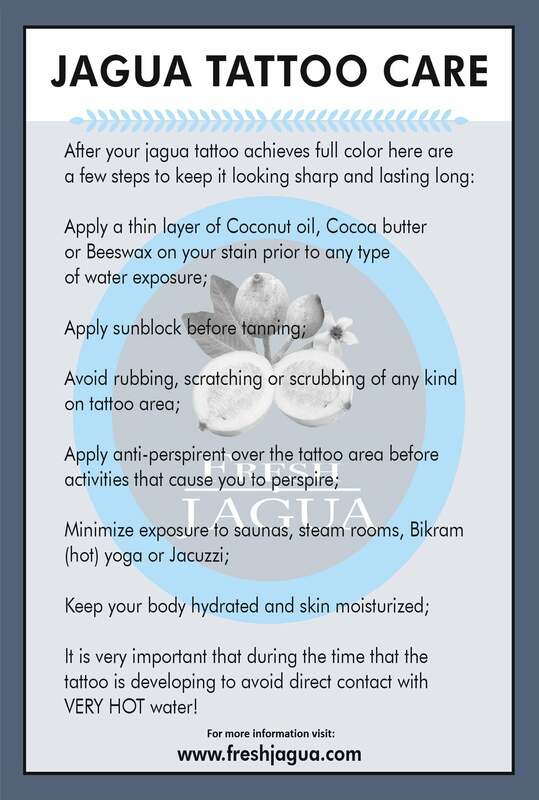 Storing the remainder jagua gel ink in the freezer will extend the jagua stain for up to one year. If you do not use your jagua Within the first month of purchase the best way to keep your jagua fresh gel is to divide it into small portion into a 1/2 oz plastic bottle and keeping it in the freezer make sure to squeeze out the while air from the bottle to avoid frozen water crystals build up. 1/2 Oz. Bottle of Fresh Jagua Tattoo Gel is the perfect product to introduce yourself to Jagua line of gels and inks for temporary tattoos. The product come pact in a soft plastic bottle and an inbuilt applicator tip to make it easy to use. When you are looking to create safe and fun looking temporary tattoos, always make 1/2 Oz. Bottle of Fresh Jagua Tattoo Gel your first choice gel since it is guaranteed to give you an awesome results you will not find from other similar products in the market. 1/2 Oz. Bottle of Fresh Jagua Tattoo Gel is manufactured using quality jagua extract obtained from the Amazon rainforest and the entire production is done carefully to ensure that you get nothing but the top quality. You will also be delighted to know that the product has been clinically. Though it causes no allergic reactions, it is highly advised that you be cautious if you react to natural ingredients like strawberries and blueberries. Also you need to be caution when using it if you have an exceedingly sensitive skin or eczema.